After the mild huge success of the All-80's Team, we're back to look at the players from a decade later. Oh the '90's. What a strange new world it was. Baseball cards were becoming glossy and overpriced. A strike cancels the 1994 World Series (Sorry Montreal!). And of course who can forget the homers, homers, homers?! One issue I noticed with the All-80's Team is that there was very little argument in the polls. So to make it more interesting and spark a little more debate, I've decided to combine both leagues instead of doing separate NL and AL features. This will also keep it from dragging on well into August. As always be sure and vote for your choice in the poll in the left sidebar. So to kick things off, in what will likely become a battle of Pudge versus Piazza, here is the All-90's MLB catchers. Notes: The 1990's marked a rebirth for the Cleveland Indians. After being a doormat in the American League for much of the prior decade, they were now perennial favorites. One of the integral parts of the Indians success was Sandy Alomar. 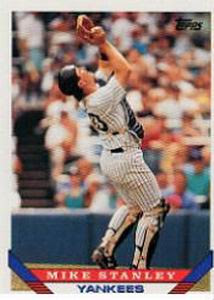 The 1990 Rookie of the Year was a solid defensive catcher with a decent bat. Nagging injuries hampered Alomar's overall potential. Notes: Never mind the guy nowadays that has appeared to have gone off the deep end. I prefer to remember the All-Star catcher who played for one of the most entertaining teams of the decade, and had a smokin' hot wife. 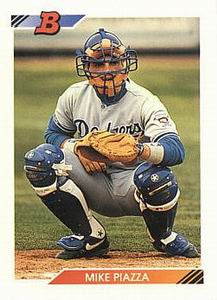 In 1992 he led the National League in RBI, which is pretty damn impressive for a catcher. 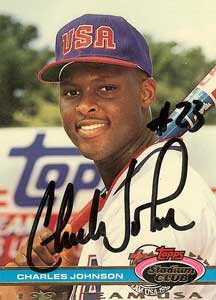 Notes: The first amateur draft pick ever for the Florida Marlins, Johnson broke out with the team in the mid-90's providing a great glove behind the plate and some decent pop on offense. 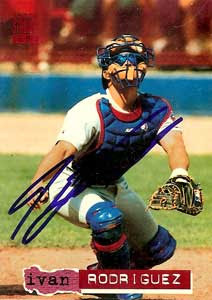 Johnson's 4 Gold Gloves were the most by any National League catcher in the 90's. Notes: Love him, hate him, question his sexuality, you can't deny that Piazza was one of, if not the best hitting catchers of all-time. I have nothing else to say about him so here's a link to him getting nailed in the head by a fastball. 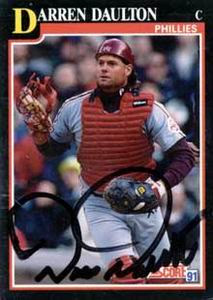 Notes: While he didn't post as big of offensive numbers as Mike Piazza, Pudge Rodriguez was a great hitting catcher and an even greater defensive one. The 1999 AL MVP will be a surefire first ballot hall of famer when all is said and done. 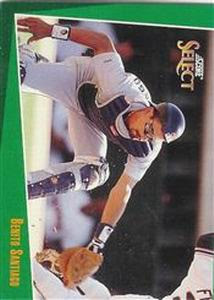 Notes: One of what will be a handful of guys that also appeared on the All-80's ballot, Benito had some good seasons with San Diego before bouncing around 5 more teams during the decade. 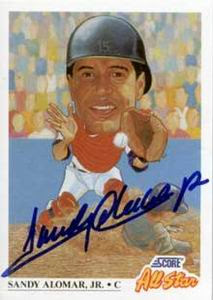 In 1996, Santiago hit a career high 30 home runs with the Phillies. Notes: Bouncing around the AL East throughout the 90's, Stanley emerged as a decent slugging catcher. 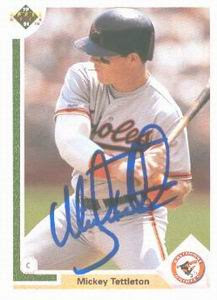 Later on in his career he became primarily a 1B and DH. His name is also a firsty firsty. Notes: Tettleton was a classic low average, high power slugger in the mold of Dave Kingman and Rob Deer, except with a much better K-BB rate. Mickey claimed that the source of his power came from eating Froot Loops. Fast forward a decade later and childhood obesity is running rampant. Coincidence? Be sure and vote for your choice of catcher for the TMS All-90's Team. Check out the poll in the left sidebar.